Something happened to me in Sedona, Arizona, where I spent a week hiking and shooting photos with Shila while working at the Sedona Hummingbird Festival. I got my eye hooked back up with my brain, through my cameras. And I haven't been able to stop collecting images. Everything is so damn beautiful. It was all I could do to leave home in late July. The birds and animals have been coming to me, right up to the window, right into the yard, and in the wild, too, whenever I go out. It happened there, too. It's like the enchanted state I felt in Sedona has followed me home. The first couple weeks in August, there's an Ironweed Festival going on here. 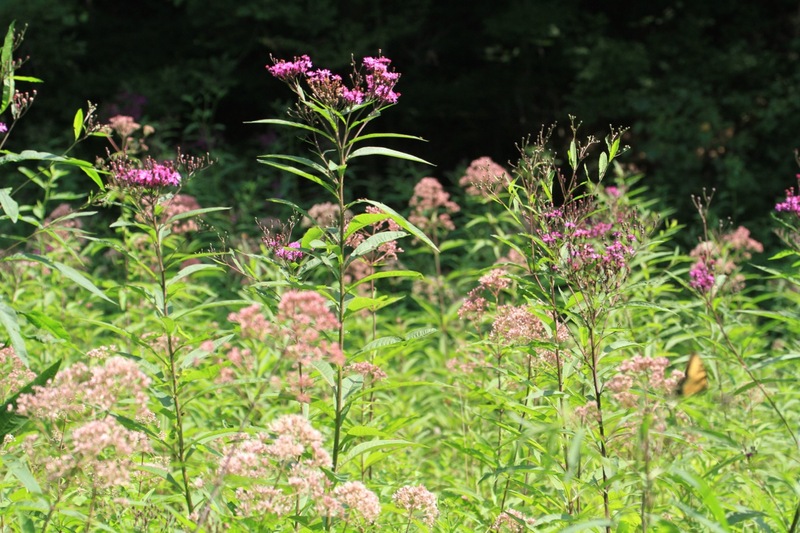 That's when the Ironweed does its thing, and the Joe-Pye weed, and the milkweed and butterflyweed too. I'm keenly missing my fellow celebrants. We're all just too busy and beset by life to eke out a gathering this August. I'm working extra long hours cutting double mats for my art for the American Birding Expo in Columbus, where I'll be doing my first show in a long, long while. I'll get to hobnob with a breathtaking array of vendors from more than 35 countries at this unique event. It's going to be amaaazing. We're expecting more than 3,000 visitors. I'm hoping to sell some prints and originals and a lotta books, notecards and puzzles! I've made eight new prints of favorite paintings and I'm excited to debut them. Gotta crank that cash flow up...life and kids are expensive. Minor detail: I'm guiding a trip in South Africa Aug. 24-Sept. 9. Expo setup starts Sept. 15. I've got to have all my show prep done before I leave. Flat out doesn't quite describe it. So Casa Zick and the entertaining that goes on here is shut down for the foreseeable future. But enough about me! There are butterflies out there, and I promised my friends an Ironweed Festival post or three, so they won't feel they've missed the whole thing. 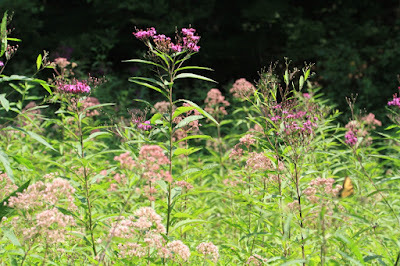 It's so hard to photograph Joe-Pye weed in masses. A photo just cannot convey the majesty of an entire meadow stuffed with its hazy rose glory. I take these landscape photos, and sigh in exasperation. Sifting out the pink from the green, which is of similar intensity, is a job for the human eye and brain. The task just befuddles the camera's lens. 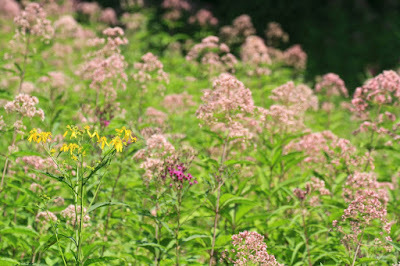 But you can see that the Joe-Pye Weed Festival is in full swing in the first part of Dean's Fork! 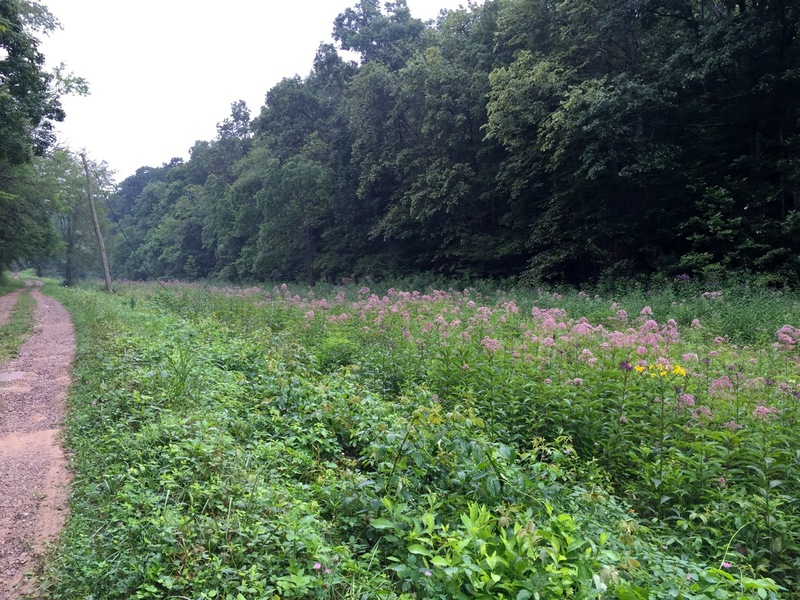 Tall ironweed, asserting itself, a foreshadowing of things to come farther down the road. 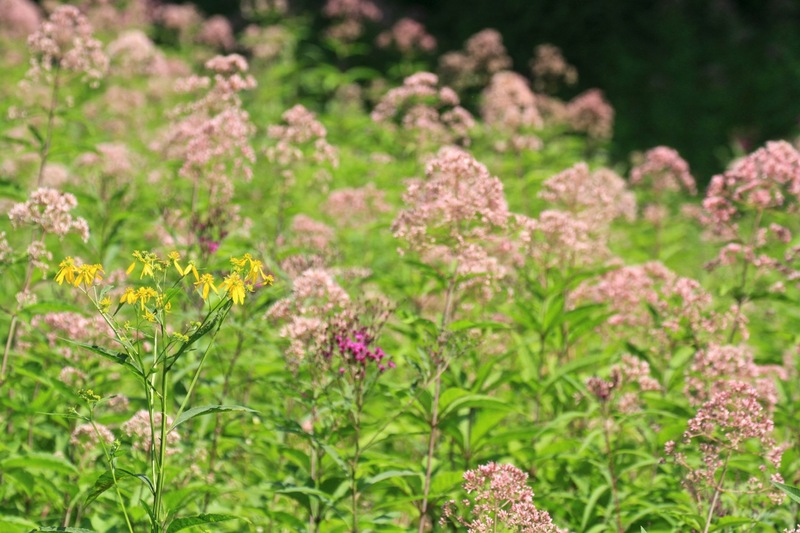 A bit of wingstem adds a welcome dash of lemon. Joe-Pye is really best in closeup. 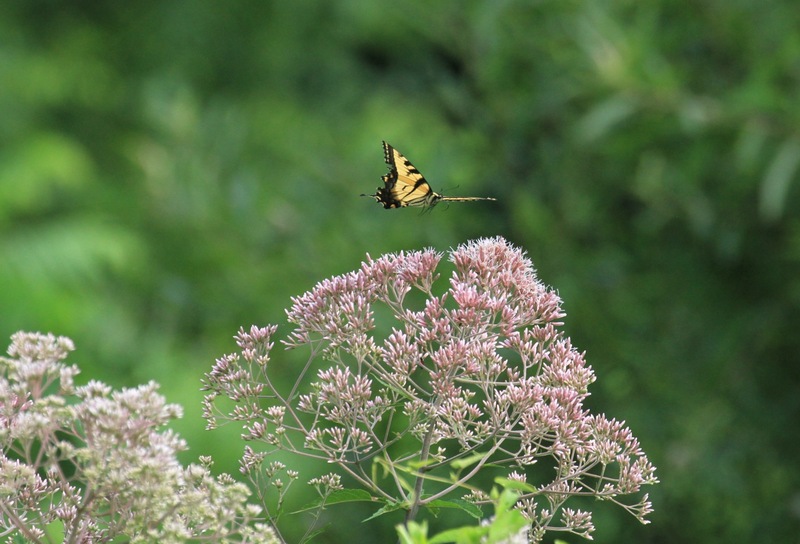 And oh, those tiger swallowtails. Photographing butterflies in flight has become a pleasant obsession. It's hard to do. You have to keep your telephoto lens focused on them while they go through dozens of florets, and watch for little cues that they're about to move on, and hope that you have them in focus when they suddenly take off. Luck plays a huge part in capturing a photo like this. Rewards are few and far between, but they come often enough to keep me utterly engaged. We move down the Fork, shooting butterflies as we go. 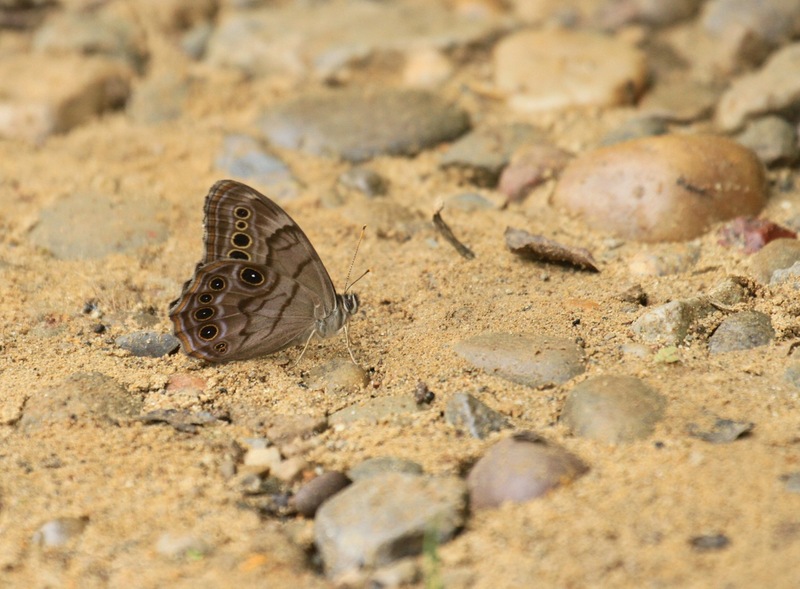 A freshly emerged northern pearly-eye flies frantically, zigzagging like a crazy moth, until it stops to rest. WOW. What a bug! Be sure to click on these photos for a closer view. They're worth it. 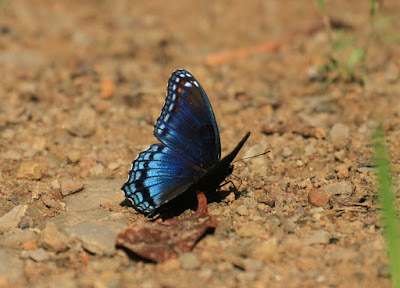 I'd always wondered why this nymphalid is called a red-spotted purple. I'd always seen blue on it before this. Catch a RSPU at the right angle, and there's the purple. Fantastic! And then it turns and catches the sun and BAM! there goes that blue light. Sometimes I call this butterfly the American Morpho. And the underside is well worth getting down on one's knees to shoot. While I'm looking down, as I always am, I notice frass in a puddle, right where it was last August 6. 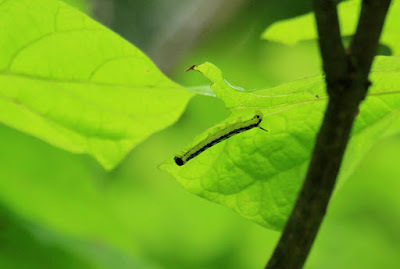 I smile and look up, to see very young catalpa sphinx caterpillars chewing away on the big heart-shaped leaves. They'll get big. 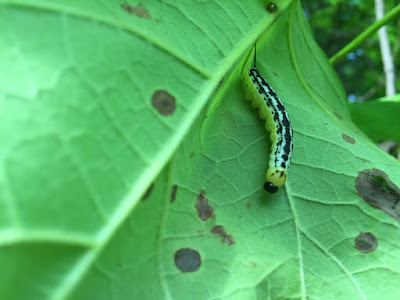 People around here call them catalpa worms, and use them for bait. Not me! They're just Zickbait. Love the little sphinxy prong off the tail end. The Bacon comes along. 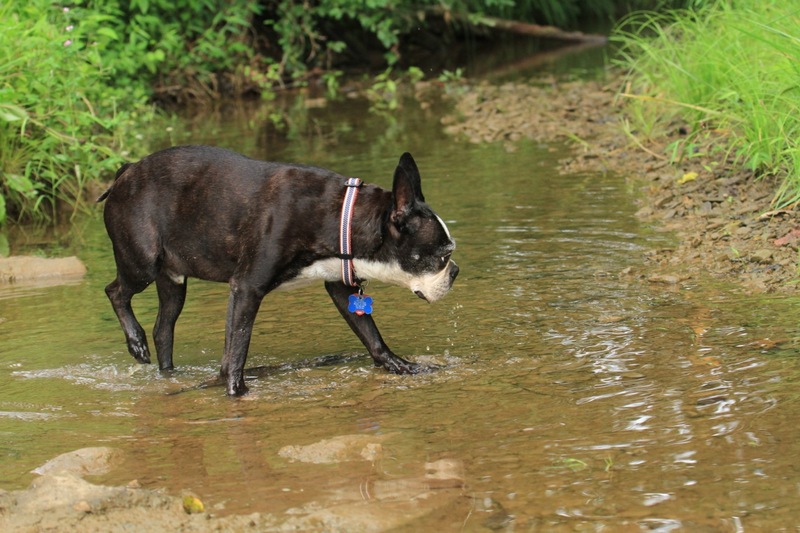 He enjoys creekwalking most of all. Kerplop, kerplop, kerplop. 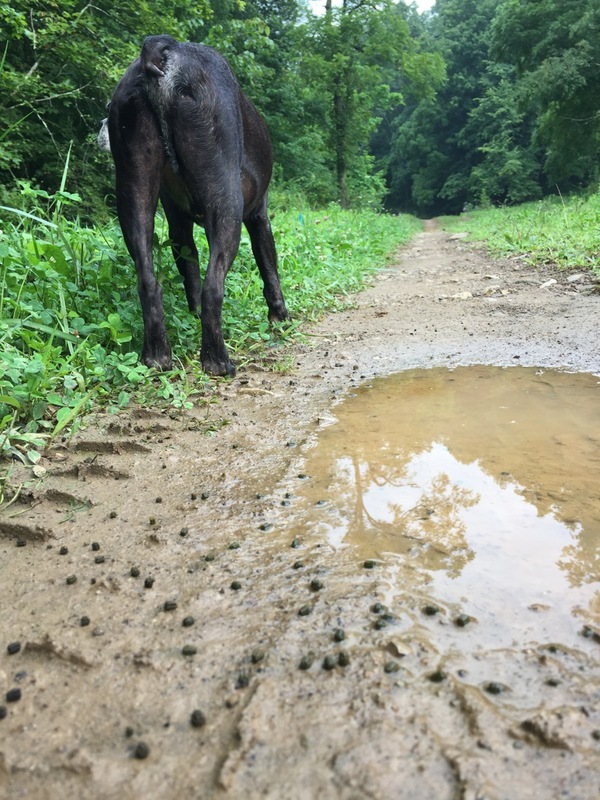 Dean's is an ideal walk or run for hot days, because it's almost all shaded, and there's cool water for Chet the whole way. 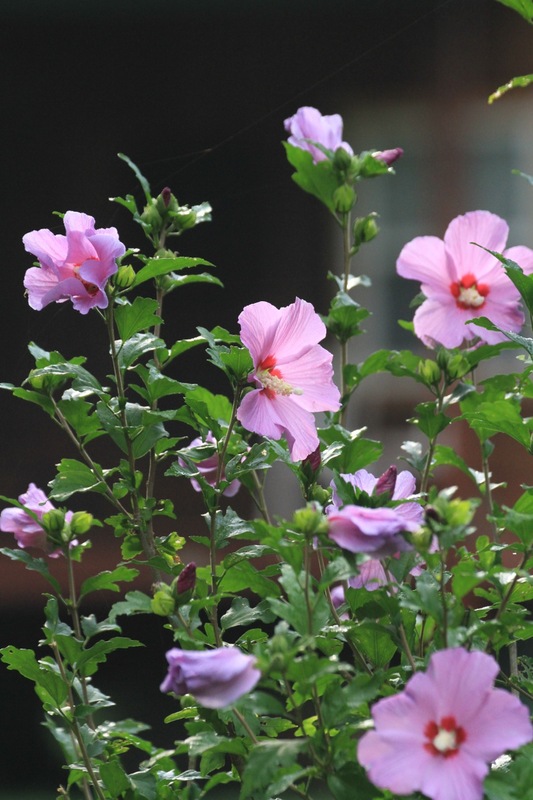 The rose of Sharon planted in front of one of the two dwellings on Dean's three mile length is abloomin'. I frame it so it's silhouetted against the mancabin's dark front. Ahh. I find dodder, a parasitic plant, throwing its long orange tendrils around the ironweed. It will use their chlorophyll-made food for its own purposes, blooming and throwing seed, powered purely by sucking the life out of other plants. 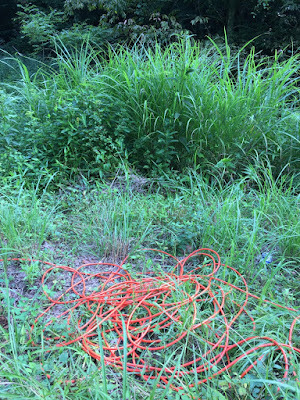 I like dodder. It's interesting. I might not want it twining through my delphiniums, but in its place it's awesome to see. 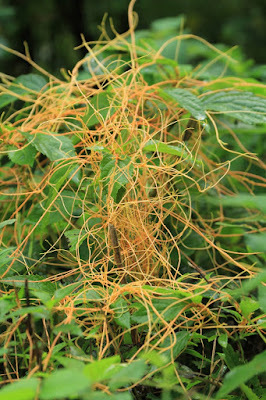 There is human dodder here, too. I don't enjoy seeing this kind. This photo has a lot encoded, for an eye that knows what it's seeing. 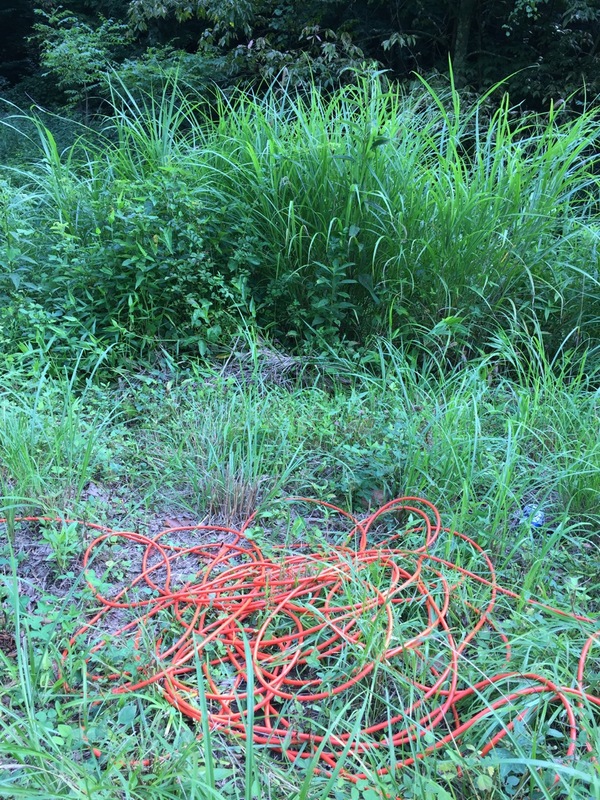 First, the tall grasses behind the cordage I found strung all along the road are Miscanthus grass, probably the most horrible invasive exotic in our county, among many, many horrid invasives. This grass comes in by windborne seeds wherever soil is disturbed. It follows the bulldozer. 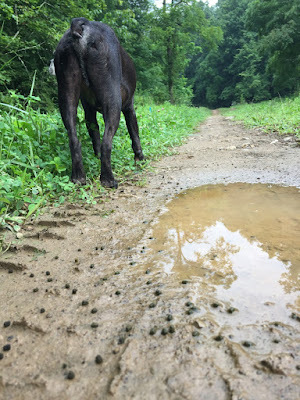 And it makes impenetrable thickets of razor-edged grass, higher than your head, that are lost to diversity, lost to ironweed and Joe-pye, lost to butterflies and deer, too. And the extension cords? Those supply power to sensors that are strung all down Dean's Fork's length, all down our road, all down every road in our area. Those sensors will pick up vibrations from enormous jackhammers that will come and pound the roads, and will by the profile they present convey where oil lies beneath the Marcellus shale that underlies all this beauty. That will tell the oilmen where to site their drillpads. It's coming. We residents are kept in the dark. We don't know where the huge rigs, lit by kleig lights 24 hours a day, will go. We find out where the drilling rigs will go in when they start construction. We bear witness, and we live through it. Some of us get paid by signing with oil companies. Some of us haven't, and don't. Whether you sign or not, it's coming, and there's nothing anyone can do about it. 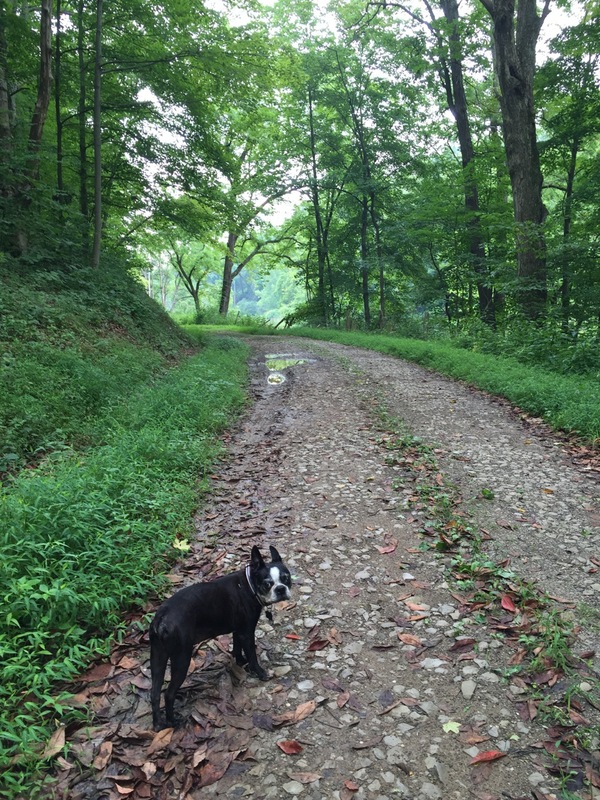 And my little dog waits and wonders what I'm doing, why I've stopped for so long. Come on, Mether. The main festival grounds are just ahead! Bill reassures me. This is not the first oil boom that has invaded Washington County. It's the eighth. His grandfather came in on the first one, came in from Tulsa to work the drilling rigs, the shallow ones that look like toys compared to the miles-deep rigs they're putting up now. Each time, they drilled and got all the oil and gas they could, and left. This time will be no different. They're drilling deeper and fracking wider; they're making a lot more noise and felling more timber and cutting more roads, but by and by these oil men will leave, too. and it's all too beautiful. 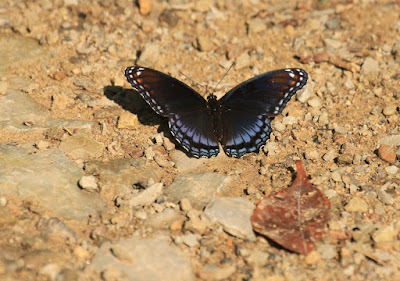 Puzzled why you refer to red spotted purple as an anglewing, Polygonia? I don't see that they are related. 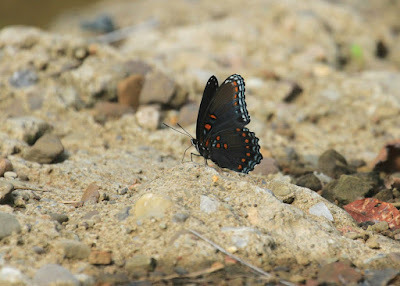 RSP and white admirals (color morphs) are Nymphalidae. I need to set aside the dudgeon about the oil pirates for just long enough to mention that I read "mancabin" with a stress on the first and last syllables ("MANka-BIN") and thought it was some kind of monkey I hadn't heard of yet. That had a dark chest. I was briefly amazed that you hadn't focused on the monkey. "...and it's all too beautiful"
I did a closeup of each of the photos. They're just fantastic! I'm heartsick reading about the oil drilling. So beautiful and so fragile. If by wishes virtual lamb's blood could be conjured over your world, and assure that all that beauty will be passed over, so I wish it. I hate to hear about the fracking. Hope they don't contaminate the water. UGH!!! I think I might have gotten a pic. of a RSPN, last weekend in Lower Al. I will have to have a look see. 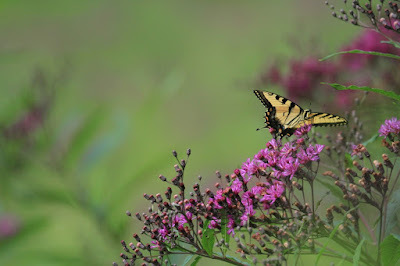 My pics weren't this good and I get it about chasing butter and dragon flies. It is so relaxing. I hope the oil people don;t come and disturb this lovely place you've preserved so well in photographs. The driftless area of sw Wisconsin was logged in the early 50's and 60's. Our property had adult trees when my husband first saw it in 1977 when he first moved here. The area was missed by the glaciers that came down from the north and is one of the oldest mountain ranges in the USA. Ocooch mountains. We said no to logging our acres but others want the money and its a very depressed area. Like there people are not thinking of nature just trying to make ends meet. We have been able to say no so far. We live in an old one-room school house built around 1854. Another structure might have been here earlier. Kids named the mountain behind the school, Camels Hump.